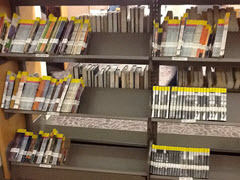 The library’s ESL collection includes books, audio cassettes, compact discs, and DVDs to support learners of English as a second language. 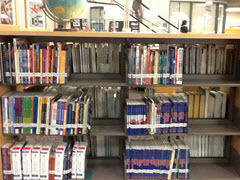 The ESL collection includes graded readers arranged by level; materials for language support, including subject-specific non-fiction titles; and Recorded Books: cassettes that come with a read along book. Graded Readers are abridged titles written in simplified English and arranged by LEVEL and TITLE of the book. The levels are color coded, and correspond to the GCC ESL Department's course levels. Click on the appropriate level for a list of ESL books arranged by level and title. Textbooks, workbooks, readers, CDs and DVDs to support grammar, pronunciation, accent reduction, listening and speaking, and vocabulary development. Books on American culture, United States History, World History, arts, music, social issues, science and more. Patrons may check out up to 10 items. Materials are checked out for two weeks. Patrons must have a valid ID (usually student card or CA driver's license) in order to check out materials. All currently enrolled students, faculty and staff have access to the Virtual (electronic) library 24/7 from anywhere with Internet connection. Students, use you GCC Student ID number as your username and six digit birthday (MMDDYY) as your password when prompted. Faculty/staff, use your GCC email login name and password.